Thrilling middleweight champion Gennady Golovkin has admitted that he faces his toughest test to date this Saturday night. The potential heir to Floyd Mayweather’s mythical pound-for-pound throne has taken the boxing world by storm over the last year by blitzing his way to the very top of the 160-pound division. Now, however, the undefeated 33-year-old big puncher, who has 20 knockouts in a row from a record of 33 wins and 30 stoppages, goes up against an equally formidable foe in IBF champion David Lemieux, exclusively live on BoxNation. The WBA and IBO world champion is well aware that the clash with Canadian Lemieux will be his hardest fight yet, in a division brimming with talent, including Miguel Cotto and Canelo Alvarez who meet next month and Andy Lee and Billy Joe Saunders later this year, all exclusively live on BoxNation. “This is the biggest test for me. He’s the IBF champ. It’s big situation, unification, pay-per-view. Right now it’s a very interesting situation to be in in the middleweight division. 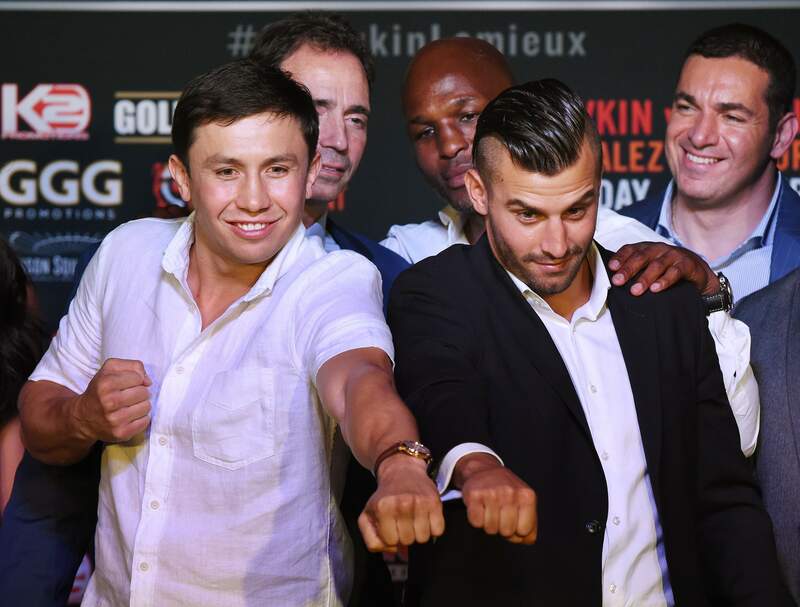 I think we have three or four fighters and it’s very important who is number one,” said Golovkin. “Right now I’m going to focus on David Lemieux because he is a good fighter. He’s champion. “The future, yes, of course [other big fights interest me], but now the middleweight division it’s a good situation, very interesting situation, three or four fighters, Alvarez, Miguel Cotto and Andy Lee – I want to unify the belts. “My goal is always about the middleweight division; my focus is on that weight division,” he said. Though Lemieux himself is no slouch when it comes to letting his fists fly having accumulated 31 knockouts from 34 wins, with just two defeats, the Kazakh assassin thinks it will come down to more than just power. “I think we both have a great punch. David is strong, too. I know my power, so it’s not just power, just a little bit different class, you know, boxing class, timing, speed, discipline, and this is very important for us,” Golovkin said. His respected trainer Abel Sanchez agrees and believes the superior boxing IQ of his charge will be the telling factor in the fight, taking place at the iconic Madison Square Garden in New York. “They both have power and speed and great knockout records but the IQ, the boxing IQ will be the difference, because Gennady thinks that it’s a different class, as far as that part of it goes, and he will be able to get to David, because he will figure him out, but David can punch so it’s not like it’s going to be an easy fight. “Both of them have punching power, but Gennady’s IQ is higher in the sense of boxing wise,” said Sanchez. The younger man at 26, Lemieux knows that he goes into the fight as the underdog despite a sensational performance in his last fight to claim the IBF belt from the tough and durable Hassan N’Dam, who he knocked down four times. “It is kind of like David and Goliath. Everyone is impressed by this big GGG, he is impressive and talented but there is also David who is making a lot of noise,” said Lemieux. “I know what I am going up against and I am going in with a nice package to deliver to Golovkin. Power is not something that frightens me. Nothing really frightens me when I’m in the ring, when I know I’m prepared. “I know I’m going to take on the strongest there is, and I’m very confident in my strength so I have zero worries going into a fight against anybody when I’m perfectly ready, which I am today,” he said. Golovkin v Lemieux is exclusively live on BoxNation (Sky 437/490HD, Virgin 525, TalkTalk 415, online or app) this Saturday night. Visit boxnation.com to subscribe. BoxNation, the Channel of Champions and proud partner of Rainham Steel, is the UK’s first dedicated subscription boxing channel. For £12* a month and no minimum term customers can enjoy great value live and exclusive fights, classic fight footage, magazine shows and interviews with current and former fighters. Previous highlights have included Haye vs Chisora, Khan vs Collazo and Mayweather vs Maidana. The channel is available on Sky (Ch.437), Virgin (Ch.546), TalkTalk (Ch.415), online at Livesport.tv and via apps (ios, Android, Amazon). BoxNation is also available in high definition on Sky (Ch. 490), at no extra cost to Sky TV subscribers, providing they are already HD enabled. *Plus £8 registration fee for Sky TV and new Livesport.tv customers.